Yes, I ate pie! Lemon crunch pie! What exactly were the Ides of March? I mean, before they acquired historical significance via Caesar? What did they signify? How did one celebrate? I'm more into St. Patrick's Day, myself. Not to go to an Irish bar and drink Guinness and Jameson (though that doesn't sound too bad) but to make a corned beef and cabbage dinner. I don't think I did that last year, but most years I have done it. Years ago, a woman I was interviewing told me she had a great recipe for corned beef. The ingredients included half a can of Guinness. "The only problem is, then you're stuck with half a can and I don't know know what you would do with that," she said. CB&C is good. I once went to a restaurant that advertised it was featuring it as a special for St. Patrick's Day. It was pretty good. I paired it with a glass of Jameson's (Irish whiskey). The Jameson's was good, too, but not good enough for me to give up scotch. Looks to be a decent weekend! I hope the weather holds, but predictions of a Nor'easter for Tuesday/Wednesday is predicted, and they can't say how much snow (if any) we'll get. Going to my parents' place on Saturday to celebrate birthdays. Both of my brothers didn't celebrate their bdays this year (Feb and March) due to snow, flu, and other issues. I generally don't go out for St. Patrick's Day......I'd rather stay home and avoid the crazy drunks to come out for days like this. Interesting info on the Ides. Thanks Jeff! This week I went to Zinburger with some coworkers, and for the holiday, their "Burger of the Week" was a Shepherd’s Pie Burger. 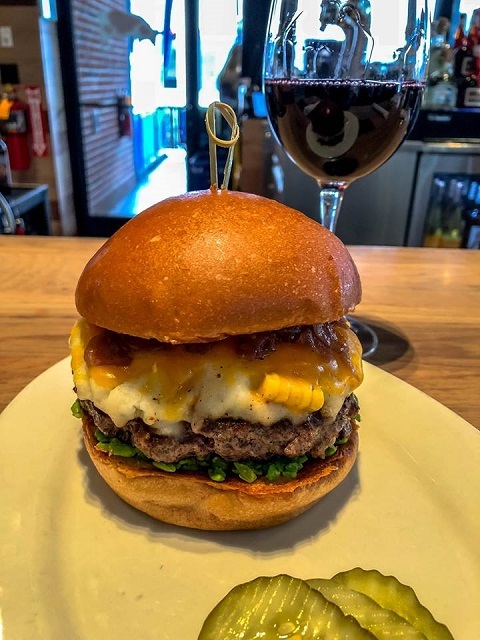 Fresh ground Certified Angus Beef patty, roasted corn, mushy peas, whipped potato, GUINNESS braised onions and Cheddar cheese. I'm with you, Jeff! I wouldn't touch it, but I'm sure others would. I can't judge, though. Last time I went to Zinburger, I got a breakfast burger. A burger topped with cheese, a fried egg, bacon, and avocado. Interesting that their day for paying debts was exactly one month before our day for paying taxes. CB&C is good. I once went to a restaurant that advertised it was featuring it as a special for St. Patrick's Day. It wa pretty good. I paired it with a glass of Jameson's (Irish whiskey). The Jameson's was good, too, but not good enough for me to give up scotch. I know. I feel the same way about New Year's Eve. Me neither! I feel like I'd like soda bread if they didn't put those damn raisins in. I'd probably try it, for the festivity of it. It sounds ... novel. And the only thing in it I'm not that crazy about is mushy peas. I mean, peas are fine, but ... mushy? Could they leave those out? But I'd probably dare eat it anyway. I always think shepherd's pie should be made with lamb. But even in the regular old recipes, it's usually beef. Lamb is more expensive, but I think it would be better. What's the Brokie line? "We came here to watch the sheep, not eat 'em"? That sounds delicious! A thin layer of hashbrowns might be nice in that, as well! I could eat almost anything with an egg on it. Which is good, because eggs are one of the cheapest foods for the amount of nutrition you get. Even free-range eggs are a bargain -- even then, you can make two for less than a dollar. It's been a while, but I think it's, "We're s'posed to guard the sheep, not eat'em." And to think it wasn't so very long ago we were advised against eating eggs because of cholesterol. I have an egg for breakfast at least twice a week, paired with turkey sausage patties. If I can't decide what I want to eat, say, for Sunday supper, eggs are pretty much my go-to, sometimes just fried, other times as an omelet. Clear blue skies here, but as they say, it's the calm before the storm. Nor'easter is coming next week, not sure how much snow we are getting. If they could just make it raisin-less, I'd happily eat it.